The cell. 4. Nucleus. Nucleolus. Atlas of plant and animal histology. Nucleolus is a distinct structure observed at light microscopy after standard histological staining (Figure 1). It is a nuclear compartment containing highly dense chromatin and a number of associated proteins. In the nucleolus, ribosomal RNA (rRNA) is synthesized and ribosomal subunits are assembled. It was described by F. Fontana in 1781. Cells usually have more than one nucleolus, and the total number depends on the cell type, differentiation state and physiology of the cell. Mammal cells may contain from 1 to 5 nucleoli. The size of the nucleolus may change along with the cell activity, sometimes becoming larger than 1 µm in diameter. In interphase, several nucleoli may join together to form a larger ones. In general, cells having intense protein synthesis show larger nucleoli. It is also larger in large size cells and in growing cells. However, in some cells, like spermatozoids, the nucleolus is not visible. Nucleolus disappears during mitosis, allowing chromatin to be packaged into chromosomes. Although the nucleolus is not always visible, and disappears in some cell cycle phases, a cell without nucleolus is regarded as dead or it is dying. Figure 1. 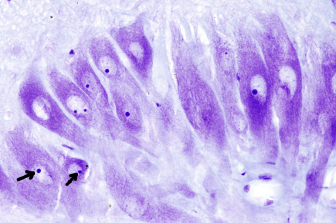 Motoneurons in the rhombencephalon of a lamprey. Nucleolus is observed as a dark dot in the nucleoplasm (arrows). The nucleolus disappears during the mitotic prophase, allowing the reorganization of chromatin to make up the chromosomes. Both, nucleolar chromatin and proteins are distributed and packaged in different chromosomes. During telophase, nucleolar chromatin decondensates and gather nucleolar proteins to form new nucleoli. 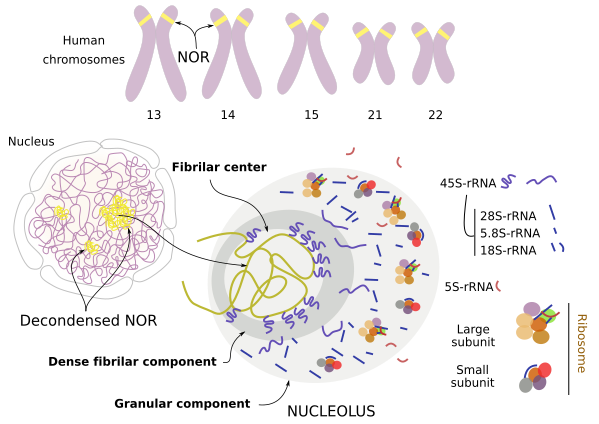 For a nucleolus to be formed, it is not only necessary the gathering of these chromatin and proteins, but also nucleolar activity must be initiated: transcription and splicing of pre-45S ribosomal RNA, and ribosomal subunits assembling. Figure 2. Fibrillar center is where the genes for pre-rRNA 45S are being expressed. Dense Fibrillar component is where pre rRNA 45S is located and processed. Granular component is where ribosomal proteins and the rRNAs, result of the pre-45S rRNA processing, are assembled into ribosomal subunits. At electron microscopy, several regions can be morphologically distinguished in the nucleolus: fibrillar center, dense fibrillar component, which surround the fibrillar center, and the granular component (Figure 2). The fibrillar center, or nucleolar organizer, is not present in all eukaryotes and its function is no fully understood. It contains DNA segments with many copies of the gen for pre-45S RNA, the primary ribosomal RNA transcript that gives 3 of the 4 rRNA for constituting the ribosomal subunits. The fibrillar center also contains many associated proteins. It has been suggested that the transcription process occurs at transition are between the fibrillar center and the dense fibrillar component area. In the fibrillar component area, the pre-45S rARN is cut into small pieces. In the granular center the resulting rRNA segments are further processed and assembled into the ribosomal subunits. Genes for pre-45S rRNA are repeated in some regions of different chromosomes. These regions are known as NOR (nucleolar organizer centers) and are located in heterochromatic regions (condensed chromatine) (Figure 3). Nucleolus is formed by the activity of these regions. The number of copies of the gen for pre-45S rRNA varies. In yeasts, there are from 100 to 300 repeated sequences, while amphibious and plants may have thousands of copies. Humans and mice have 200 copies. However, only part of these genes are usually transcribed to pre-45S rRNA (about 50 % of them in humans) at the same time. The proportion of of copies of the pre-45S rRNA gen simultaneously transcribed is higher when cells are in need for high amount of proteins. Figure 3. Regions of the nucleolus. NOR regions of the 5 human chromosomes are depicted in the upper part. 28S, 18S and 5.5S rRNAs results from 45S rRNA processing. 5S rRNA comes from other region of the nucleus. Why so many copies of the pre-45S rRNA are needed? Most proteins are synthesized from only one single gene. This is the case for erythrocyte hemoglobin and myoglobin of muscles. These proteins are abundant because many mRNAs are transcribed from the same gene, and each mRNA is translated many times into proteins. More than 1000 proteins can be synthesized from translations of one single molecule of mRNA. So, we have two amplification steps, transcription (many copies of mRNA from one gene) and translation (many proteins from one mRNA molecule). When the final product of the expression of a gen is not a protein, but an RNA molecule, the second amplification step is missing. A single eukaryote cell may contain a huge amount of ribosomes and all of them are made up of rRNAs and therefore it needs many rRNAs. One copy of a gene for all the rRNAs may be not enough. Cells solve this problem by having many copies of the same gen. Figure 4. 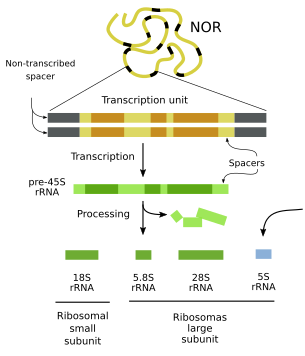 Processing of pre-45S rRNA, transcribed from NOR regions, in the nucleuolus. nucléolo. There are two genes that code for rRNAs: one for pre-45S rRNA and one for 5S rRNA. In humans, the 200 copies of the gene for pre-45S rRNA are distributed in 5 chromosomes. RNA polymerase I transcribes these copies. It has a high affinity for the promoters that helps to increase the number of pre-45S rRNAs. 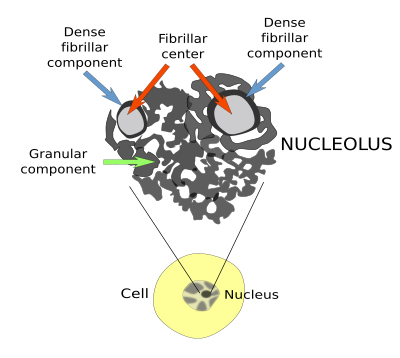 The copies of the gen for pre-45S rRNA are gathered together at some places in the nucleoplasm to form the fibrillar center of the nucleolus (Figure 4). 5S rRNA is part of the large subunit of the ribosome. There are around 2000 copies of the gene for 5S rRNA, which are transcribed by type III ARN polymerase. However, the gene copies for 5S rRNA are not part of the nucleolus. pre-45S rRNAs has to be cut and trimmed into other smaller rRNAs that will be components of the ribosomal subunits (Figure 4). This processing ends up with three new rRNAs: 18S rRNA, 28S rRNA, and 5.8 rRNA. As it was mentioned earlier, 5S rRNA is synthesized in other region of the nucleoplasm. The long pre-45S rRNA molecules continuously produced and processed in the nucleolus. The large ribosomal subunit contains 5.8S, 28S, and 5S rRNAs, and the small ribosomal subunit contains 18S rRNA. Assembling the ribosomal subunits is a striking process. First, the transcription of genes for ribosomal proteins occurs outside the nucleolar region (Figure 5). Then, the mRNAs cross the nuclear envelope thorough the pore complexes and are translated by free ribosomes in the cytoplasm. These new ribosomal proteins enter again into the nucleus and reach the nucleolus, where they are associated with the rRNAs to form a complete ribosomal subunit, either the small or the large subunit. Once assembled, ribosomal subunits cross again the nuclear envelope toward the cytoplasm, where they start working in translation. 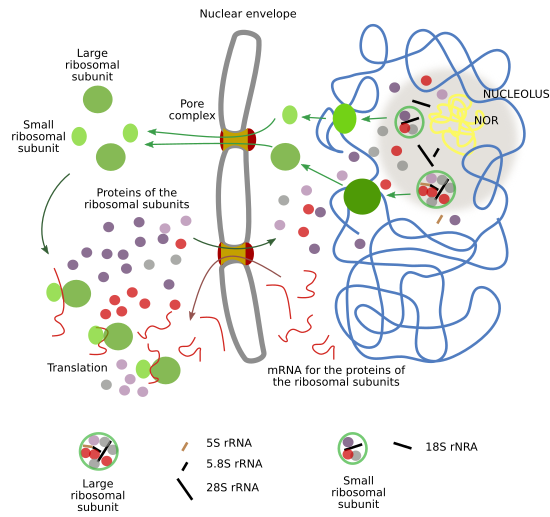 In this way, the nucleolus is a consequence of the presence of many molecules and processes going on at the same place at the same time: ribosomal genes being transcribed to produce pre-45S rRNA, proteins involved in the processing of these transcripts, ribosomal proteins to form ribosomal subunits, plus proteins involved in subunit assembly. Alltogether, it is estimated that around 690 different proteins are more or less permanently associated with the nucleolus. Figure 5. Trafficking of ribosomal components between the cytoplasm and the nucleoplasm. There are non-permanent proteins in the nucleolus. Many proteins remain in the nucleolus for short periods of time and then can spread through the rest of the nucleosplasm. However, they stay longer in the nucleolus. Since not all these proteins are related to the synthesis of ribosomes, it is thought that the nucleolus develops additional functions. For example, there are proteins in the nucleolus involved in processing other non-ribosomal RNAs such as small nuclear RNAs, some participates in several steps of the tRNA processing, there are also kinases and proteins for repairing the DNA.